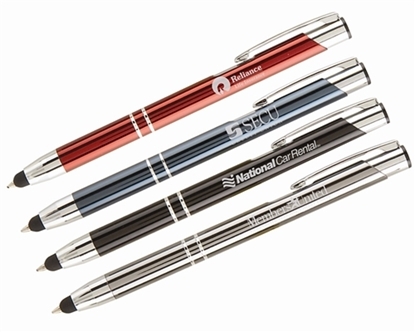 The Detroit Pen has single color printing in an assortment of colors. Black rubber grip. Metal chrome accents with a plastic barrel. 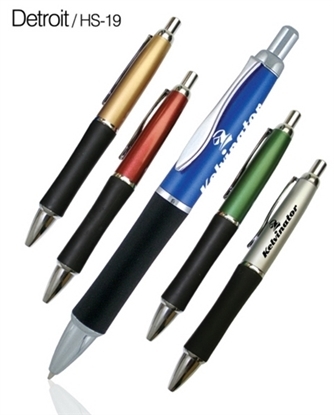 The Dome 5 Pen has single color printing in an assortment of colors. Dome rubber grip. Chrome clip and accents. 3 imprint areas. 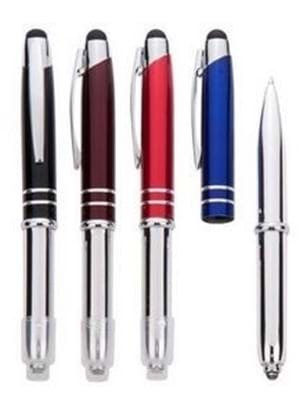 Retractable, Contoured Body, Rubber Tip, Medium Point, Pocket Clip, Comfort Grip, Writing Instrument, Light, Flashlight, Pointer, and Twist Action. Shorty Retractable Ballpoint. Giant Pen! Twist-action ballpoint pen and stylus on one end and a flashlight on the other. Translucent color pen with top LED flashlight. Retractable mechanism. Black refill only. This jumbo ballpoint pen with plunger action and grip section is a thoughtful way to show clients that you are concerned for the well being of their hands. 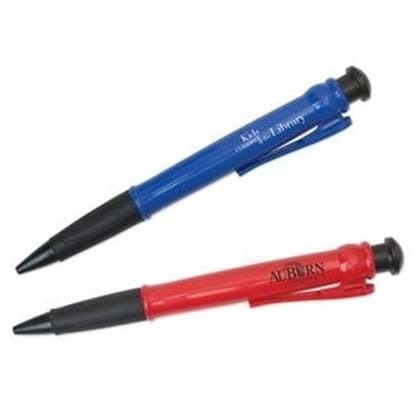 Customized with your company's information this is an excellent promotional giveaway for your next trade show event. Pen is 11" L x 1" W.
Union Printed "Stylus with LED Light" Stylus Silver Pen with Rubber Grip. A Perfect Give-away Low Cost Promotion, Never a need to Shop for Close-outs. Available in Single or Assorted Colors. 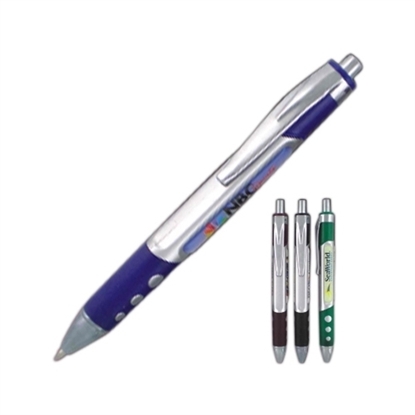 This multi-function pen offers a "touch" stylus at the tip and LED light on top. Contoured barrel and bold colors. White and silver imprint available. Black on silver barrel. Now this is a BIG Highlighter! Measures 8" long and has a cap that secures on the back for convenient mobility. Highlighting fluid matches barrel color. White highlighter has yellow ink. 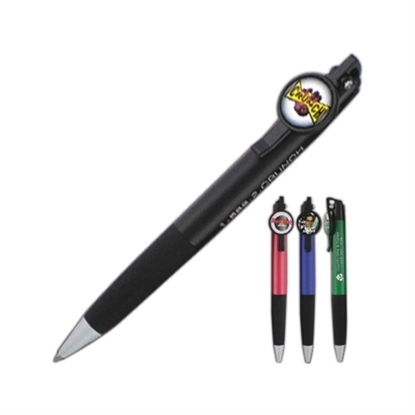 These slim twist hotel stylus pens with LED flashlight are made from high quality plastic material. They have a stylish rubber grip and available in 5 different colors. 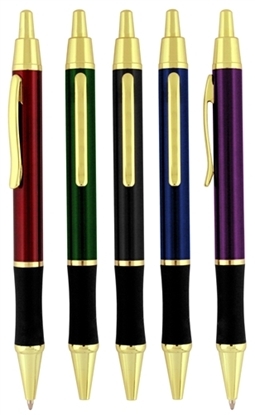 The Logan Pen has single color printing in an assortment of colors. 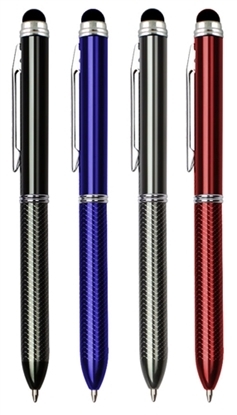 Twist pen writes in two colors blue and black. Clip and trim accents. 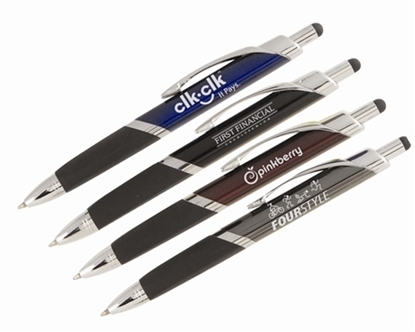 Our colossal click-action pen is twice as large as a regular pen and features a comfort rubber grip. Use either the jumbo barrel or immense clip for your imprint. Two barrel imprint locations. 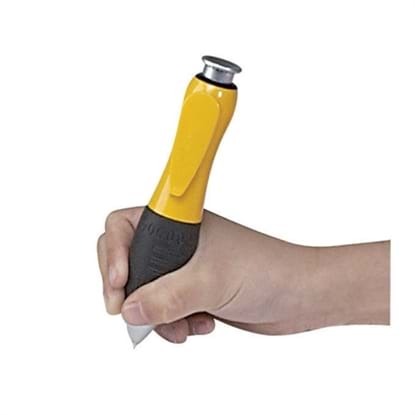 Easy-to-use retractable mechanism. 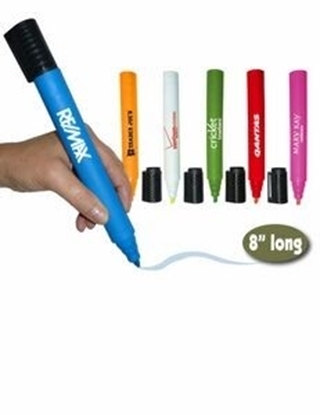 So BIG, this pen is guaranteed to draw attention to your promotion. High quality ink. Pen is 11" W x 1 1/2" H x 1" D.
Multi-function at it's best. A twist pen, highlighter and stylus in one. 6 colors to chose from. Graphite barrel and rubber grip. 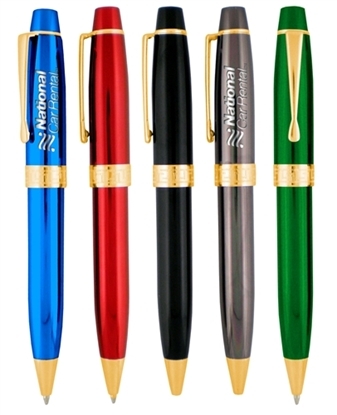 The Murano A Pen has single color printing in an assortment of colors. Black rubber grip. Chrome clip and accents. 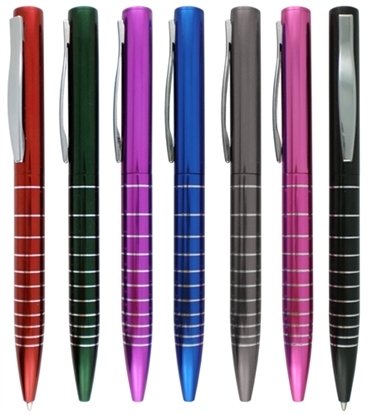 The Murano B Pen has single color printing in an assortment of colors. Black rubber grip. Gold clip and accents. Our new jumbo pen is a unique gift for employees, families and students. Measures 11 1/4". Ideal for trade shows, campus bookstores, and museum gift shops. The Pavillion G Pen has single color printing in an assortment of colors. Laser etched band design. Gold clip and accents. Three-sided barrel. High end, retractable pen with "touch" stylus feature at the plunger tip. Perfect executive gift. 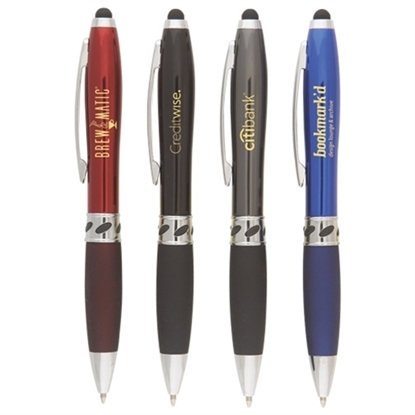 This jumbo 4-color ballpoint pen with grip section measures an impressive 10.5". Writes with blue, black, green and red ink. 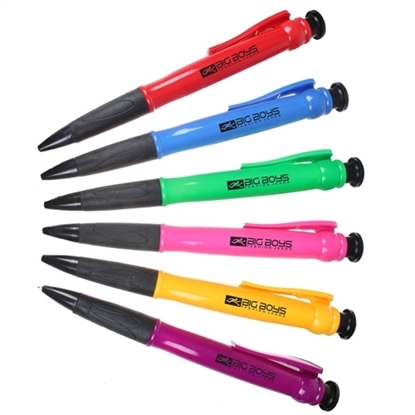 If you want to be remembered in a BIG way, use this over-sized pen as your next promotional giveaway. Pen is 10.5" L x 1" W.
Metal Ballpoint Pen/Stylus/LED Flashlight. Chrome Finish Plastic Barrel and Chrome Rings. Colored Metal Cap. 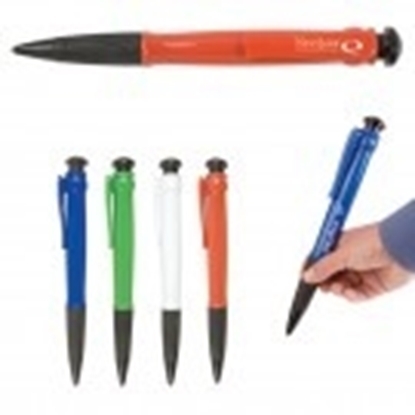 Our Popular Nexus Pen is now available with "touch" stylus feature at top. 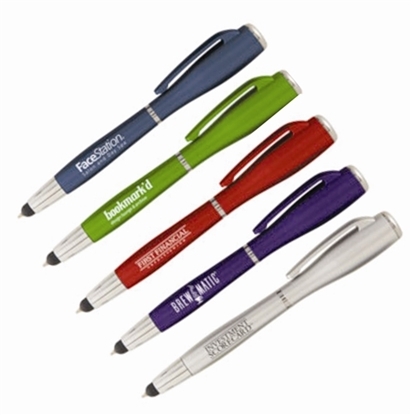 The Dome 4 Pen has single color printing in an assortment of colors. Metallic barrel with black clip rubber grip. This multi-function has it all. This is a professionals favorite. 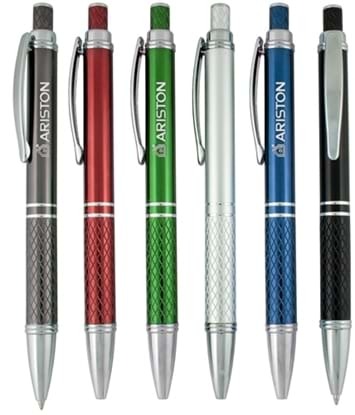 Twist action pen, with a red button activated laser pointer adorned with "touch" stylus. Useful stylus on plunger end. Four high gloss enamel barrel colors. Attractive chrome filigree band. Ergonomic hour glass shape. 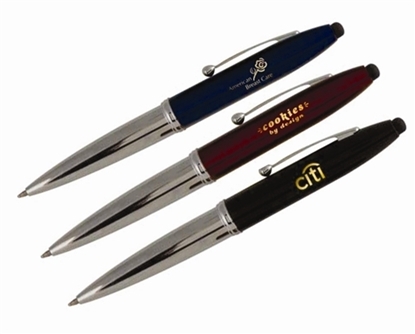 Jumbo rubber grip for comfortable writingSilver engraved imprint. Free black oxidation on white pen. Each pen is individually cellophaned. 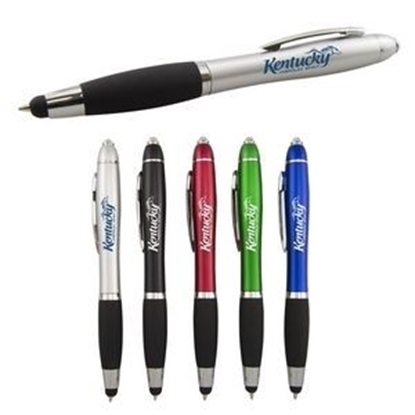 Mypromotionalpens.com offers the largest and best priced selection in Promotional Low Minimum Pens. We will price compete and we won't be under sold. 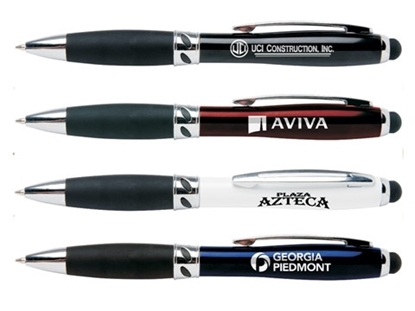 Let our graphic designers make your personalized Low Minimum Pens standout above the crowd at no charge. We won't stop until you are completely satisfied with your custom Low Minimum Pens art proof.Use category search filters on your left to help narrow your search to find exactly what you are looking for.